Musing On Beauty: Le Metier de Beauté Couches de Couleur technique: yay or nay? Le Metier de Beauté Couches de Couleur technique: yay or nay? So as I told you a while ago, Zuneta started carrying Le Metier de Beauté, and this brand has been so hyped amongst bloggers during the past years that I really wanted to try it. I already had a little play with the shadows here but I used them the traditional way, while LMDB have their own method that they call "couches de couleur" - litterally layers of colors. If you want to see it demonstrated, here is a little video for you. 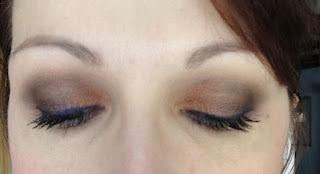 The gorgeous evening makeup featured in the videos actually triggered my eyeshadow order, as I thought it was really beautiful. Warm up: Resembles your natural blush color. Everyone has a different color, some people have more red, some more pink. To determine what tone you are, you should clench your knuckles and look at the color by the protruding bones. Give depth: Usually placed at lash line, gives a veil to the entire look. If you want additional information on this technique, I recommend checking fellow blogger and Lipstick Bandit Xiao at Messy Wands - she's the resident LMDB expert, in my opinion, and she has tons of FOTD and swatches available. 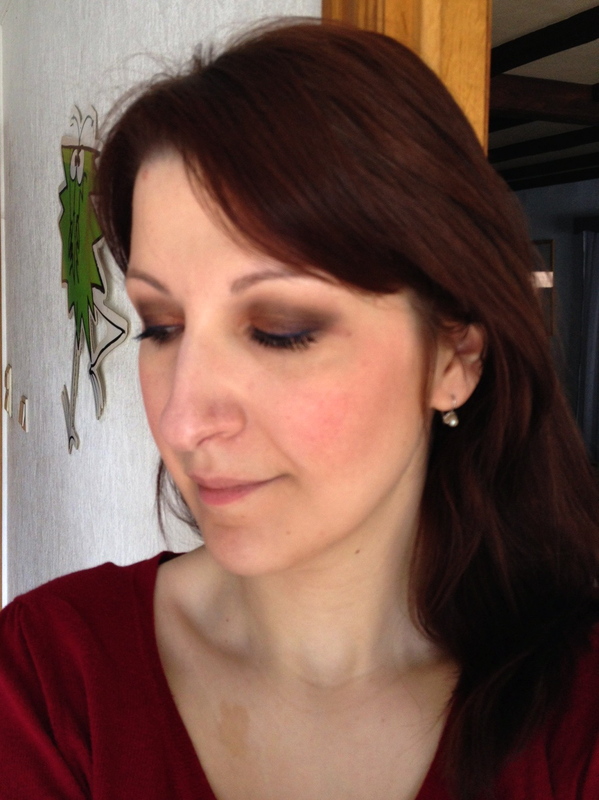 Now, I did try and use that technique with some eyeshadows I already owned but didn't find it worked too well and thought that there had to be something to the LMDB's eyeshadows that would allow them to work better this way. Liner is a Nars Larger than Life pencil, not an eyeshadow. My opinion on the technique. Let us be honest, there is a very tight line before depth-giving technique and muddy mess, and I'm not sure I didn't cross it here. I found it not that easy to layer the colors equally on both eyes and to get an even result. As a matter of fact, it is not even: the dark blue has darkened an eye more than the other. 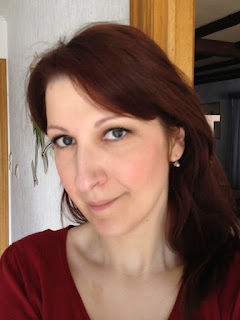 I am also not totally convinced that this is flattering on my eyes, as I do need shading to make up for my hooded lids. In a look where the same colors are layered overall, there is no creation of depth in the crease. Probably not the best technique for me, then. I might be overthinking here but lots of looks I've seen on blogs were done the traditional way (lid, crease, outer v, liner...). Would that be an indication that this technique does not work as it should for lots of us? My opinion on the eyeshadows. I did not really find there was anything special to their texture that made layering easier. Could I still use them the traditional way? Sure, but again, I'm not sure they then have enough added value to justify the price. They're not buttery soft nor über pigmented like Rouge Bunny Rouge for example. In short... From my experience, I would not recommend splurging and spending over 90€ for a kaleidoscope or over 30€ for a single shadow unless the color is really unique and something you have been really looking for, or unless the couches de couleur technique works particularly well for you. I am unconvinced. While I do think many of the LmB Kaleidoscope palettes have interesting and even enticing colour combinations, I also feel the couches de couleurs technique is a gimmick, and the beauty of each shade gets lost in the occasionally sludgy result. There are some that seem to blend better like Antiquite Poupee as seen on The Beauty Lookbook, and there are others that result in a taupe-y dustiness, in which case, why not just go for the single shadow in Corinthian? As I said I noticed that lots of people use them the conventional way and rarely use the layering technique - maybe it is indeed too gimmicky. Also the way they talk about the warm up color makes it impossible for kaleidoscopes to work for everyone, there's some contradiction there IMO. I'm not convinced that LMdB shadows are worth the price, however I am somewhat intrigued by this technique. I think it's one of those cases where the model (and you) are gorgeous so you could have thrown makeup at your face and it would still have looked good! I think because I have less eye lid space... it would look super murky? It's nice of you to say that Mimi, I'm not that enthusiastic about the result lol. thanks for the input on the blushes! Thanks for your honest review. As you know, I was disappointed by my blush kaleidoscope and won't be trying anymore of the LMdB line. You're welcome! What's the point of trying so many products if we can't share disappointments as well! Sorry you were disappointed, but I tend to agree with you. I have zero interest in the kaleidoscopes. I often get swept away by temptation, but my one hard-and-fast rule is that an eyeshadow must be able to stand on its own. That I'd need FOUR to make the look work is just a marketing gimmick IMO. I'm not saying the palettes aren't beautiful or high quality, but I am not one bit interested in wearing warm-toned eyeshadow. Yeeeeeech. If I want sludge, I'll wear Edward Bess Intimate or Dusk eyeshadows. I have tried several LMdB products and actually disliked every one of them. The lipgloss color wore off and left a crazy foiled metallic sheen on my mouth. I looked like the Tin Man in the Wozard of Oz. Oh boy, that doesn't look like an attractive look, thanks for the warning! It is refreshing to see such honesty, especially since I totally agree with you. Thank you for your post. I lost interest in the Kaleidoscopes when they lost their originality and became variations of the same color theme. As for Couches de Couleurs, it's a marketing gimmick that actually takes away from much of the fun and creativity that comes with using palettes because LMdB maintains that colors need to be applied in a specific order. I recently had my makeup done by one of LMdB's national makeup artists. He used a limited edition Kaleidoscope that made my eyes look muddy and sludgy. Everything else he did on me was beautiful so I conclude that the fault was the layering of the Kalidoscope and not a lack of skill on his part. I was one of the first to jump on the LMdB bandwagon and I still love the glosses and lipsticks, but the eye Kaleidoscopes? Meh! It's a gimmick. Well I'm glad to know my technique is probably not the culprit then! Interesting. The blogosphere does make it seem like these are the creme-de-la-creme of make up products. The colors look very, very beautiful on you my dear, but I don't know your collection well enough to know if you feel they are unique. To each their own of course but for me personally, this didn't live up to the hype. "layering the 4 colors creates maximum contrast with your eye color"...yeah, and it makes you buy 4 shadows to get a look you could do with two. Big eye roll. While I applaud makeup houses that try to evolve makeup application and expand the medium, I can't stand it when they inflate claims to be so self-important. And I've tried many, many, many different beauty brands and have yet to find an eye shadow that's worth almost $40 a pop! What colors did you use? You did not say? The same as in the video.